I was born in Shelby,Mississippi but actually grew up in Mound Bayou,Mississippi which happens to be the oldest all black town in the United States.Growing up in Mound Bayou was a great experience for me.It was a small town rich with African American culture.There was not a lot of crime in the community when I was growing up.In fact you could leave your doors unlock and wouldn't have to worry about anyone breaking into your house.I remember as a youngster how my buddies and me would go on weekends to what we referred to as uptown and observe how the grownups were socializing.This was my first experience with people using profanity and drinking alcoholic beverages.In my household no one used profanity or drinked any alcoholic beverages.As I got older I use to hear the old timers talk about how my father use to drink and carry on.Some of the things I heard them say about Pops are legendary.He passed when I was only eight years old and he had quit all those things that I heard about him when he met my mother.He instilled a lot of positive things in me at an early age and to this day I continue to carry them on.He was a strong positive man and I loved him dearly.My buddies and I loved going uptown to observe the grownups and even though there was profanity and alcohol consumption it was a positive enviroment.Of course a fight or two broke out sometimes but never any killings.This was also my introduction to the blues and southern soul music.Bobby Rush,Tyrone Davis,Buddy Ace,Denise Lasalle,Lynn White and other local blues artists would come and perform all the time at the local juke joints and I just can remember all the excitement that it brought to town.Those times were truly the good old days. 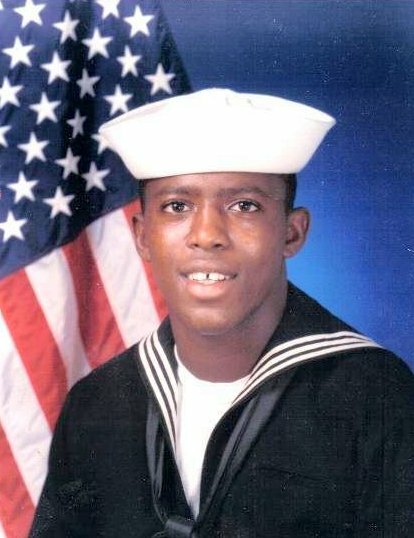 I graduated from High School in Mound Bayou and then entered the U.S.Navy.I came from a very humble background.College at the time would have been hard for my family so thats why I joined the military.The miltary at the time was good.The country was at peace.I did my Basic Training(boot camp)in Orlando,Florida and I attended A School in Meridian,Mississippi.It was good to come back home after being away for the very first time.After A School I was stationed in Norfolk,Virginia aboard the U.S.S. Abraham Lincoln CVN-72.At the time it was the newest aircraft carrier in the Navy.Life in Virginia was a drastic change for me.In the dead of winter we had a blizzard along the entire eastern seaboard.For a country boy from Mississippi to experience a blizzard for the very first time was not good.I might have cried for momma,I can't remember.My ship got reassigned to the west coast and I didn't won't to go.We got stationed in Alameda,California just outside of Oakland and San Francisco.Shortly after we arrived Operation Desert Storm was going on I'll never forget the day that I found out that I had to go over there.I didn't won't my mom to worry so it was two months before I even told her.The war made me look at life in a whole different way.I was just glad that GOD allowed me to return home safe.After returning from Desert Storm I left the Navy.I stayed in California for about two years and returned home to good old Mississippi. The city life had spoiled me because it was always something to do in the city so coming back to this rural area was a little diffucult believe it or not.There aren't a lot of jobs here and we are still losing some of the few jobs that we do have.I've been blessed to have been able to work these last 12 years without losing any employment.Three companies that I worked for closed down but I've always left before the closing.God just has allowed me to time everything just right.I've started a family and I just purchased a new home a couple of years ago.I've had my share of ups and downs but by the GRACE OF GOD I have been able to maintain. I currently reside in Renova,Mississippi.I am employed as a Inventory Clerk(Group Leader) for Pharmedium Healthcare in Cleveland,Mississippi.